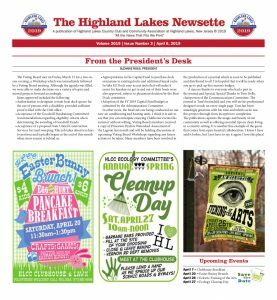 This is your online source for accessing the current issue–and the historical archives–of the Highland Lakes Newsette, which is published 18 times per year by the Highland Lakes Country Club and Community Association. The Newsette was first published in 1949, providing members with information on club happenings, rules, and news. That tradition lives on today, both in the traditional print format and online, thanks to the tireless efforts of the Club staff and numerous volunteers. Nearly every article that appears in each issue of the Newsette is written by individual members of our community. Writers do not receive any compensation for their stories, but the Newsette continues to thrive as a news source for our community through the editorial efforts of individual members, committee chairpersons, Trustees and Officers, and others who contribute articles and information on a regular basis. Additionally, the Newsette is produced by the Office staff and members of the Communications Committee in conjunction with a local printer who uses modern digital production technology to lay out and print the Newsette. If you would like to submit an article or a shorter update for publication in an upcoming issue of the Newsette, please follow these few easy steps. In addition to this website, physical copies of the Newsette are available at the Club Office and the Activities Center (summer months only), the Lake Wanda Store, the Highland General Store, the Marketplace Deli, and the US Post Office. The winter Newsette, which is published once monthly from October to the first issue in May (except for January), is available via regular mail for members who don’t want to read it on this website and/or unable to stop by the Clubhouse or other locations to pick up a copy. 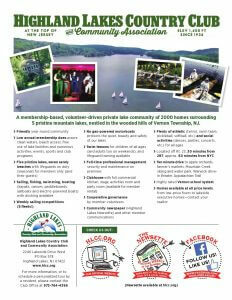 The subscription fee (to cover mailing) is $0.47 per issue which is payable by cash or check to the Club. 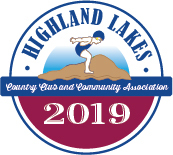 Your printed name and address (or labels), with payment, can be left at the Club Office or mailed to HLCC, PO Box 578 Highland Lakes, NJ, 07422. If you want to receive specific issues rather than all seven of the winter issues, please include explicit instructions and payment of $0.47 per issue for each issue requested when you drop off or mail in your request.